(Phnom Penh, Cambodia). The Feast of Mary Immaculate reminds me of an incident that happened in our school on the 24th of October last year. 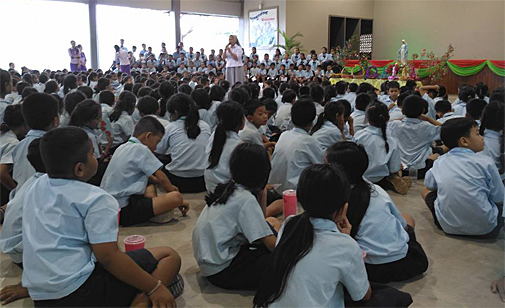 Once again, Our Blessed Mother made us experience Her protective presence among us and our children at Don Bosco School, Teuk Thla. The construction of the new high school was in its final stage and the building was being readied for its inauguration in December that year. Top soil was bought from outside to enhance the garden and speed up the growth of the plants and trees. In the late afternoon of the previous day, 23rd October, as the gardener and two other boys were transporting the soil and leveling the ground, they spotted a round thing in the newly-bought soil. They set it aside together with the other debris. But Hon, the gardener, was reminded of something he had seen before in his village: the round metal object, as big as a small saucer, looked like a landmine! Without moving or touching the object, Hon looked closely at what was written on it, now partly hidden by soil and dirt. And indeed it was a locally-made landmine! He warned his two companions and he carefully shoveled the round mine into a safe corner away from where the children and other people in the school usually passed. He knew that when hit or triggered, that innocent-looking object could cause unspeakable destruction to human life and property. In fact, many people with missing limbs, people who are blind or handicapped in various ways whom we see around in Cambodia, have been landmine victims. Hon told the sisters about what they had found and immediately the next morning, Sr. Neath called up a non-governmental agency engaged in locating, removing and detonating mines – the Cambodian Mine Action Committee (CMAC) which, fortunately, was close to the school. Three men from the NGO came immediately and took away that still unexploded mine which, if not for the maternal protection of Mary and Hon’s alertness, could have caused untold damage and suffering! Because of the great and indiscriminate damage caused by landmines and anti-personnel devices, groups and concerned citizens all over the world banded together to campaign and lobby against its production and use. With pressure from a number of campaign groups organized through the International Campaign to Ban Landmines (ICBL), a global movement to prohibit their use led to the 1997 Convention on the Prohibition of the Use, Stockpiling, Production and Transfer of Anti-Personnel Mines and on their Destruction. The Mine Ban Treaty was signed by 122 countries in Ottawa, Canada on 3rd December 1997; Cambodia was an active signatory. Currently, a total of 161 nations are party to the Ottawa treaty. In Cambodia, Jesuit Service (JS) has successfully led the campaign to ban landmines. It continues to rehabilitate and empower landmine victims, including ex-soldiers of the civil war, especially through vocational training. Young women who have been victims of landmine blasts have also undergone training in sewing-embroidery, secretarial-computer skills, cooking, baking and home management at the Salesian Sisters’ training centers and other NGOs.